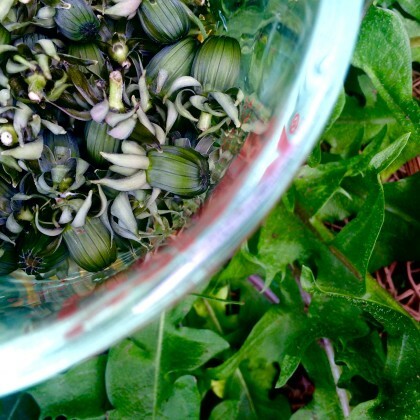 When making pickled dandelion flower buds, you’ll want to make sure the flower buds have not opened yet. Check out the picture on the right. The top is a dandelion flower bud that has not opened yet. The bottom is a flower that has opened, been pollinated, and is making seeds. While the seeds may have *some* medicine, the unopened bud is packed full of medicinal goodness. The amounts of ingredients will depend on the size of your jar. 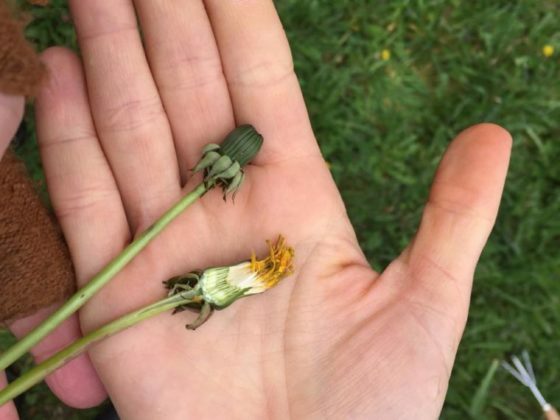 The dandelion flower buds will be 2 – 3 parts, with the onion, garlic, and ginger being 1 – 1.5 parts. Mix this up in a bowl, and transfer to your jar. Fill your jar 1/3 the way up with your tamari or shoyu, then fill the jar to the top with the ACV. Put on a lid, place the jar on a small plate or in a small bowl, and let steep on the counter for one month. If you use a metal lid, you’ll want to place several layers of parchment paper between the lid and the dandelions to ensure that rust will not happen. You can choose to use a glass or plastic lid to avoid this completely. The pickled flower buds will keep for up to a year in the fridge. You an utilize everything in the jar!